Happy last Friday of 2016! I don't know about anyone else but I will be celebrating tomorrow with a little Veuve, some yummy food and a super comfy outfit while playing games and maybe watching a movie or two. I've definitely realized the older I get, the less I feel the need to do anything over the top to celebrate NYE. Don't get me wrong, I enjoy going out but I can save it for the days when things are less hectic out. Before the year is over I wanted to share a few of my favorite beauty products of 2016. I definitely got some Christmas gifts that I have to share with you all so linking up with Amanda for the last Friday Favorites of the year! 1 // I have officially traded in my Clarisonic for the Foreo and I'm not looking back. I got this Luna for Christmas and from the first time I used it I knew I loved it. I was extremely skeptical about it's cleaning ability but I could immediately feel a difference after the first use and to really put it to the test I washed my face one night with the Clarisonic and then used a cotton pad with toner after and then did the same thing with the Foreo the next night and I was definitely left with more makeup residue with the Clarisonic than the Foreo. 100% sold. 2 // I suffer from acne scars, sun damage and redness on my face, especially in my t-zone. My mom got me this for Christmas and I am in love. The smallest amount goes a LONG way in covering my imperfections and making my skin look flawless. It goes on so smooth and I often wear it by itself without foundation, that's how great it works! 3 // I have a bad habit of biting my lips. When I'm nervous, stressed or sometimes just subconsciously, I have a tendency to bite. This has definitely resulted in some extra lines in my lips that weren't always there (I'm sure age hasn't helped either). I've tried multiple lip plumpers just to be disappointed so when I got a recommendation for this I was pretty reluctant but it's the best one I've tried so far! It doesn't give you that Angelina Jolie pout but it definitely makes your lips fuller and it's not super sticky. I've also heard great things about this one which is next on my "to-purchase" list and considerably cheaper. 4 // This is still by far my favorite wet hair brush. My hair gets SUPER tangled when I take a shower (or pretty much do anything) and despite having a pretty tough head, it's torture brushing my hair after it gets wet but this brush makes it so much easier and I find that I lose less hair using it. 5 // No matter what time of the year, I am always oily around my nose and chin and it drives me crazy. I picked up this face wash and I am so impressed with not only how refreshed my skin feels after using it, but how less oily my skin is throughout the day. Don't get me wrong, it doesn't keep me completely shine free all day but it has definitely made a HUGE improvement. 6 // Lately I've been a huge fan of Hourglass beauty products and this highlighting blush is what started it. For awhile I was running a little late getting ready in the morning so I was rushed to do my makeup and highlighter was not happening. I came across this when I needed new blush and I love that I can use it without a highlighter and still have that gorgeous glow. 7 // I will continue to swear by the Fresh Sugar Lip Treatments as long as they never change the formula. I've had almost every color and I honestly can't pick a favorite. As someone with extremely sensitive lips this is by far my go-to. Not only is it extremely moisturizing but it also has SPF which is perfect for being out in the sun here in Florida. 7 // No matter how many times I try a new dry shampoo, I keep coming back to this one. Maybe this year I'll learn that nothing is going to top it and I'll stop trying new things only to be disappointed. 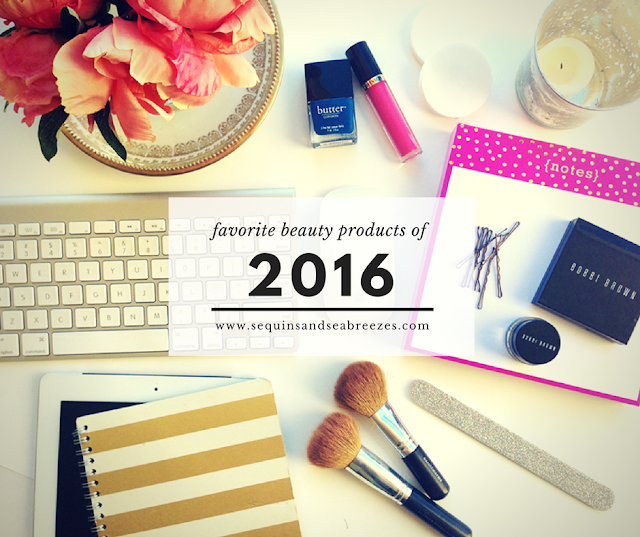 And there you have it, my favorite beauty products of 2016! I hope everyone has the most amazing (and safe) New Year's Eve. Talk to everyone next year! Happy new year friend!! Have a great, cozy night in! Can't wait to see what 2017 has in store :) cheers!! I love so many of these products too! Especially Hourglass blushes. Their bronzer is my absolute FAVORITE! Hope you have such a wonderful New Year girly! The it Cosmetics foundation sounds fantastic! Love their products. Have a happy new year, girl! I still haven't tried IT Cosmetics, but I think that I need to in 2017! Everybody always talks about how amazing they are! And I have an Hourglass highlighter, but I'd love to try out the blush palette. It just looks so pretty! I hope that you have a very happy New Years! I'm so glad you mentioned that dry shampoo again. It reminds me to give it a try because I still haven't found one that I am in love with. Have a wonderful New Year's Eve Pamela! I love IT cosmetics products, so I totally need to check out that product. I have the wet brush and love it, it helps dry my hair much faster after washing. Such cute packaging for that dry shampoo! Happy New Year girl! great roundup girly! that wet brush is awesome. i think i only use them now! necessary with our fine hair. i need to trip that lip stuff and you know i love fresh sugar balms. i have been meaning to try that dry shampoo too but you're right - when you find one that works you stick with it! happy new year love! cant wait for the new year! Your NYE sounds fantastic to me - we stayed in last year and loved it. We're "going out" this year but only to the neighborhood clubhouse - I never like anything too big either - Happiest New Year! My thoughts are right up your alley for NYE since it can get crazy in downtown Orlando and other hot spots. Dealing with the crowds becomes less appealing and I now prefer celebrating with close friends. I need to check out #3 since I have the occasional nail biting situation as well. Awesome, glad you found products that you love! Those are some fab beauty picks!! I use that brush on the girls I take care of! I shared my faves recently on the blog if you wanna take a peep. Seriously I just want the entire IT cosmetics line all of their products are cult classics for a reason! I stopped using my Clarisonic a year (or more?) ago because I felt like it was too rough, but lately I've felt like I need to do more exfoliating, so I'm definitely going to check out the Foreo! I've definitely wondered about that Dior lip plumper, and you now have me sold to give it a try! i don't have a Clarisonic but i am intrigued, might check out the Foreo instead. and i have all the same issues as you with scars and redness, so when i'm allowed to start buying makeup etc again, i'll be checking out that bye bye redness stuff. i've heard amazing things! the best picture which are taken by mobile phone, you can find here amazing 'mobile phone photography'. for seeing images click here "Mobile Photography"